For most companies, an ERP system is generally at the center of the business systems strategy. But a comprehensive applications portfolio includes much more than ERP. Most companies, even small and midsize businesses, have a surprising number of important systems outside of ERP. By way of example, Figure 1 shows our proposed future applications landscape for a current client of Strativa. (Company-specific references are removed). Although just a midsize company, it has plants and distribution centers around the world. As a result, the future applications portfolio will be quite extensive. At the core, within the red circle are the core ERP functions. 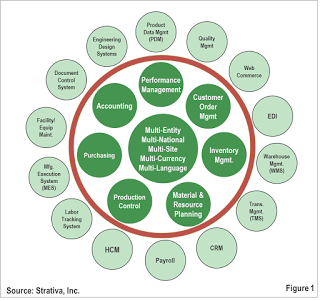 Outside the circle are other enterprise systems that must interact with the core ERP system. Nearly all of these systems will be new, or replacements of current systems. Traditional ERP vendors have long recognized companies such as our client as a market opportunity. If customers need more than ERP, then providing these point solutions are a way for vendors to gain an increasing share of the customer’s IT spend. In response, Tier I vendors such as SAP and Oracle extended their ERP systems into integrated suites of applications, such as CRM, supply chain management, HCM, and other point solutions, either by building them from scratch or acquiring them. Mid-tier vendors, such as Infor, Microsoft Dynamics, IFS, QAD, Epicor, and others followed a similar strategy, enlarging their application footprint. From our client’s perspective, bringing some of those point solutions “inside the circle” has several advantages. Integration will be simplified—assuming the vendor didn’t just acquire the point solutions without doing a good job of integrating them. There could be cost savings–assuming the vendor incorporates the point solutions into base system functionality, or prices them competitively against independent solutions. Moreover, upgrades could be simplified—assuming the vendor ensures compatibility of its systems during version upgrades. The strategy of offering an extended suite of enterprise applications is a well-worn playbook. But what about newer cloud ERP vendors? One of the criticisms often leveled against them, especially those focused on manufacturing industries, is that their functionality is not as rich as that of the traditional vendors. Their architecture may be state-of-the-art, but they still need to fill gaps that traditional vendors addressed in the 1990s. Moreover, to build a complete solution, buyers are often forced to engage with multiple partners for complementary solutions. It is not unusual, for example, for buyers of systems on the Salesforce.com platform to have to engage with three, four, or even more AppExchange partners to satisfy their requirements. NetSuite is one example, with its long history of providing CRM alongside its full ERP suite of modules. Moreover, NetSuite is one of the few ERP providers—cloud or traditional—that has web commerce as a part of its integrated offerings. To be sure, NetSuite has an extensive community of SuiteApp partners building on and extending NetSuite functionality. But NetSuite has also been acquiring some of them that have widespread appeal to its target market. Its 2015 acquisition of eBizNet for warehouse management and 2016 acquisition of IQity’s SuiteApp solution for advanced manufacturing are two recent examples. NetSuite’s broad functional footprint was likely a factor in Oracle’s recent bid to acquire the firm. FinancialForce is another example, with its 2013 acquisition of Vana Workforce (now FinancialForce HCM). Because FinancialForce ERP and Vana were both built on the Salesforce.com platform, it was not difficult for FinancialForce to bring HCM “inside the circle.” FinancialForce’s HCM functionality now includes core HR, talent management, recruitment compensation, time management, and absence management. The latest example is Plex, which this week announced its acquisition of DemandCaster, a cloud provider of supply chain planning systems. Plex had already been partnering with DemandCaster for the past year, and both vendors build on the Microsoft stack, so integration is already accomplished. Interestingly, Plex was already one of the few ERP vendors—cloud or traditional—that offered full manufacturing execution system (MES) functionality alongside its core ERP offerings. Moreover, as the first cloud ERP provider focused on manufacturing companies, it has a functional footprint that is wider and deeper than other ERP providers, at least for its target manufacturing sectors. By bringing both MES and now supply chain planning “inside the circle,” customers can reduce the number of additional point solutions that they need. In ERP, especially in the manufacturing industry, there often is still a trade-off between modern cloud architecture and the deepest and widest functionality of traditional ERP providers. But the gap is narrowing. As cloud ERP providers bring more functionality “inside the circle,” the value proposition will continue to increase. One word of warning is in order, however. Just because a vendor can check the boxes for extended functionality does not mean it is the best option for all customers. Buyers should evaluate capabilities for systems “inside the circle” against those provided by independent providers. It may be that the benefits of integration, cost savings, and ease of upgrades overcome gaps in functionality, but buyers should understand what they are giving up to get them. This entry was posted in CRM Selection, ERP Selection, HCM Software Selection, IT Strategy and tagged Cloud, Epicor, ERP, FinancialForce, IFS, Infor, Microsoft Dynamics, NetSuite, Oracle, Plex, QAD, Salesforce.com, SAP, SFDC. Bookmark the permalink.